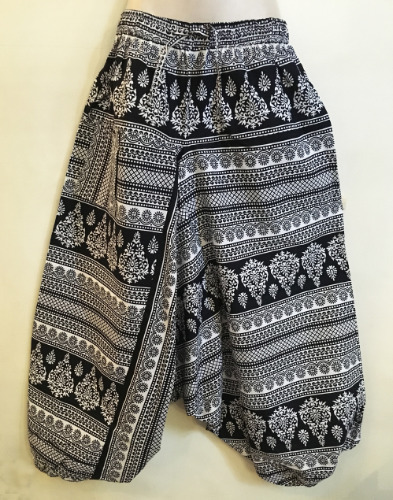 These harem pants come in assorted ethnic black and white Jaipuri patterns. We choose from availble stock. Hippie clothes. Bohemian clothing. Artsy clothing for expressive women! Retro Miss presenting classic gypsy hippie chick bohemian shabby chic styles for creative women. Handmade boutique styles at affordable prices. 100% Cotton peasant harem pants with elastic waist and drawstring, elastic cuffs, and one handy stash poacket with a cute wooden button.These are super comfortable baggy harem pants with a low crotch. Very trendy right now. Beautiful Indian Ethnic Jaipuri print pattern fabric. Authentic 70's style. Because of the handmade nature of these garments, sizing varies. The measurements here represent an average measure of this garment. These harem pants come in assorted ethnic black and white Jaipuri patterns. We choose from availble stock. Check the measurements below.